Makes a thoughtful hostess gift. The perfect way to display those fresh picked spring flowers. Our Serpentine swirl vase is virtually unbreakable and small in stature, making it a perfect accent for your desk, or any other small space. 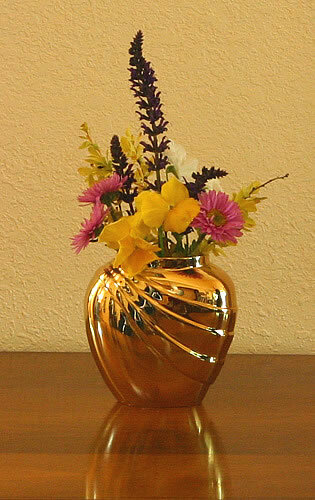 This lovely vase is cast of solid brass. Stands 4 3/4 inches tall, and is 5 inches across at it's widest point. The top opening is 2 3/4 inches by 1 3/4 inches. The brass is lacquered to prevent tarnishing, and weighs 1 pound, 3 ounces. The vase is available in both Silver and Polished Brass. Cast of solid brass, this lovely vase is virtually unbreakable, making it the perfect choice for use in precarious places. Available in Polished Brass, or our Silver Plated finishes.